It will take you to a screen with a list of your vocabulary. If you click on the "Practice Weakest Words" button on this screen, it will take you to a general review lesson. 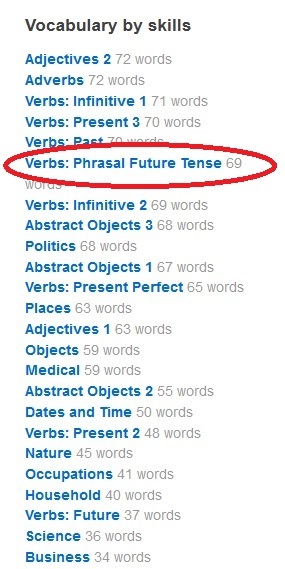 Alternatively, you can search through your vocabulary in a number of ways. Any time you have multiple vocabulary words listed, you can choose one of three ways to sort your Vocabulary. It defaults to sorting by the last word you practiced, but by clicking on the arrows you can reverse the order or sort alphabetically by word or sort by word strength. Each word will have a bar next to it indicating Duolingo's assessment of your strength in that word. Word strength is determined by an algorithm based on how long ago you first encountered the word, when the last time you practiced the word was, how often you get questions with this word incorrect, and how often you "peek" at the word in your lessons. Weaker words will show up more frequently in your practice sessions. If you click on the Practice Weakest Words button here, it will give you only questions pertaining to this skill [I'm not 100% sure about this, can somebody confirm?]. Clicking on an individual lesson will show you all of the words that you learned from that lesson. Sometimes, however, you may not remember the specific lesson, or you may not need to see the rest of the words in that lesson because you know which specific word needs practice. For this, there is also a search feature, where you can type in the word that you want to find. It will only search words in your target language, so if you want to figure out how to say something, typing in the word in your native language here will not help you. 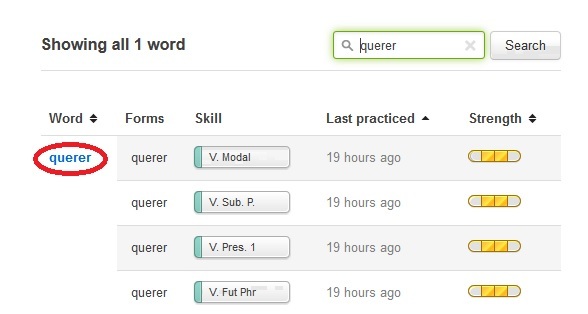 If you have already selected a specific skill or lesson, the search feature will only search the words within that skill or lesson. Once you have found the word you are looking for, click on it. It will take you to a screen dedicated solely to that word. At the top of the screen it shows you the word with a button to hear what the word sounds like. Underneath that on the right there is a button to practice that word. If you click on it you will be given a lesson with one question for every form you have encountered that word so far. You will have fewer questions for words that you have not encountered many forms for, and it adjusts your number of hearts accordingly. If you are less than full strength in that word, you will also see below the Practice Word button an option to remove that word from your practice sessions. 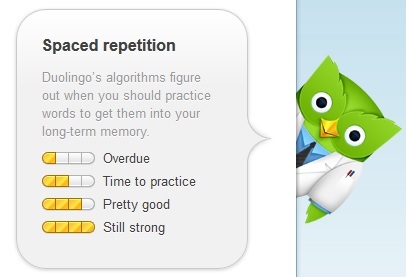 If you removed the word by accident or you ever decide you want Duolingo to begin applying its decay algorithms to the word again, you always have the option to add the word back to your practice from the word's page. Words that are added back in this way are always restored at full strength, so you may need to wait for it to start to decay before it will appear in your general practice sessions again. If you want to see the forms of the word that you've encountered, those are listed on the left side of the screen on a word's page. 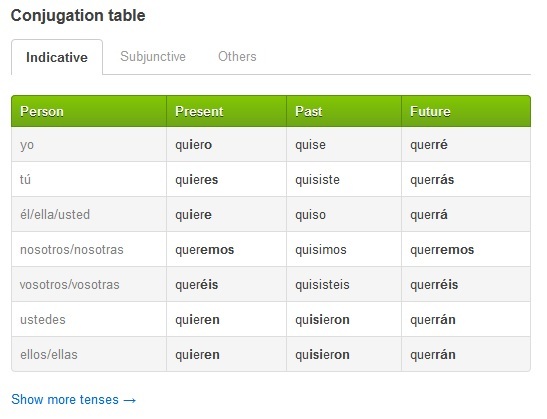 If you scroll all the way to the bottom, it will also give you a conjugation table, with various tabs and options for more tenses if you encountered forms that don't fit on the basic table. This is meant to be a supplement to the guides created by Usagiboy7. I don't have as much experience as they do at creating guides, so please help me if you see something that needs changing or adding. 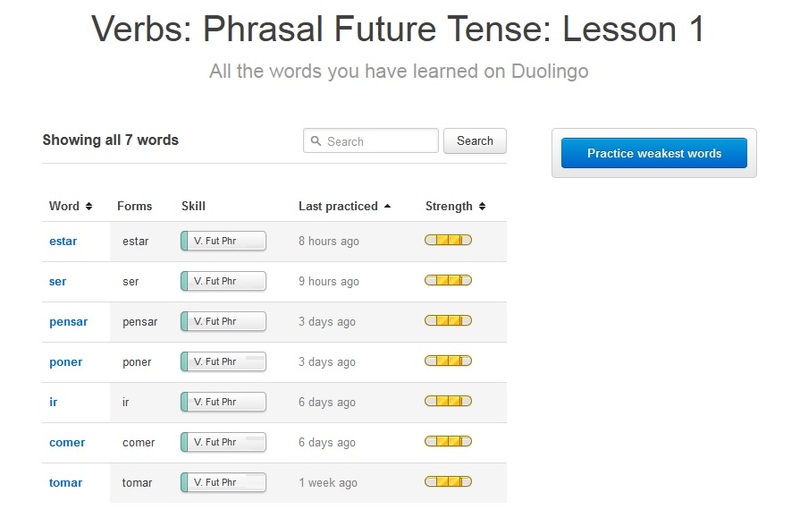 I just noticed you added my guide to the Guide to Duolingo Guides ( http://www.duolingo.com/comment/1278938 ). Squeeee! Excellent.. What Brilliance comes as each of you outshines daily. We should take bets as to which one of you burns out first. I miss this sooo much. It was super helpful; it's heartening to know that it's being worked on, not abandoned! Where is this menu option now? 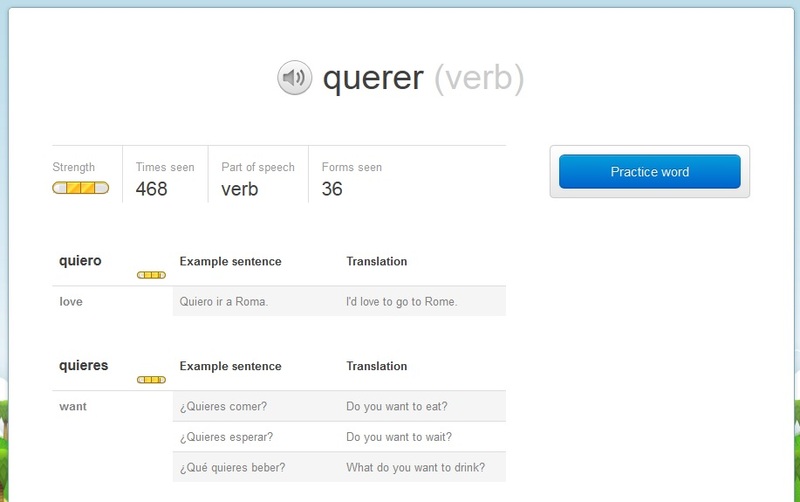 Duolingo is working on the vocabulary feature. The previous version was being vastly under-utilized by the majority of Duolingoers. So, the design team are trying to re-work it so that it will appeal to and help more people. It could be coming back in April/Mayish. tis now MARCH 2015. Why duo, why? July ... gone. I forsee August slipping right by as well. It was there in August '14, but I don't remember where it is. Even if there was just a list of words learned thus far would be helpful. I can't view my word list like my friend can. Help? Sometimes Duolingo randomly assigns people to test groups that have different features from everybody else. It's possible that you're in a test group that doesn't have the "Words" feature. Is it possible to get the words feature? For anyone who has created one of these guides, I've backed mine up on Google drive (by editing my post, using that mode to copy the text with the formatting marks, and then pasting it into a google docs new document.) I was thinking about the glitches today and decided to back up these many hours of work. Wanted to bring it up in case you wanted to do the same with yours. Q: Will the Vocab Tab be added to the Beta Layout? Thanks, I've added the quote and the link. Very useful. Well done dolphin! I just removed some words from practice but the gold bars have not been restored to full. How will the words be strengthened now? Thanks in advance! They will not be strengthened until you restore them. Once you restore them they will automatically go back up to full bars. Oh I see, thanks! So there's no way to not have to practice a word but still have it maintain full gold bars? Hi Revdolphin, thank you so much. This post very great ! But I don't understand what is mean of "peek"? Can you answer for me? Thanks. The vocabulary feature on Duolingo has undergone some changes. The only information I have on it is what's been written here http://duolingo.wikia.com/wiki/Strength. I hope this helps! I read it, but one thing what i want know, if i peek one word, my activity will effect to strength of that word? yes or no? because, sometime, my mouse touch any word where i don't want. How to use this feature to lean English from Vietnamese? This is an outdated forum. I clicked on the desktop's vocabulary option but it doesn't give me a button to practice any of the "weaker" words.